The quest for inner and outer perfection is over! 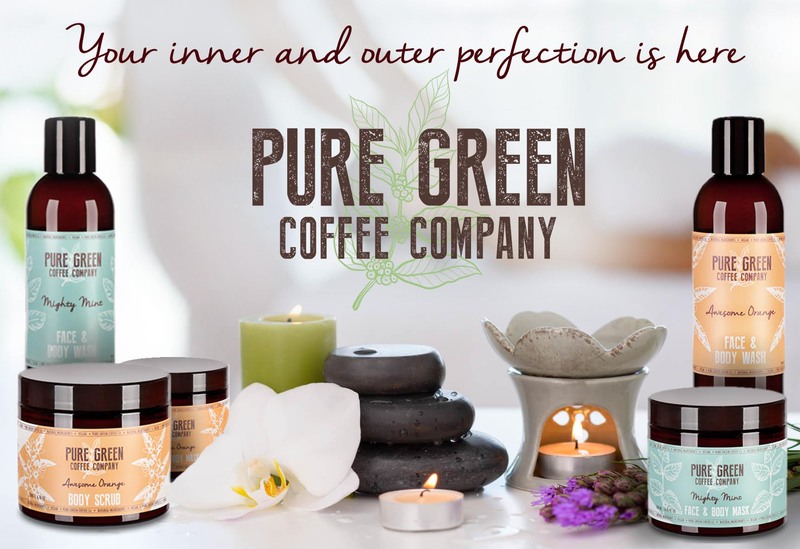 Pure Green Coffee Company have teamed up with the very best specialists to bring you pure green coffee detox and skincare products. Try our Detox Green Coffee or our Detox Green Coffee Cappuccino. They’ll cleanse and energise you from the inside. And our new Body Scrub, Face & Body Wash and Face & Body Mask, all of which come in both Mighty Mint and Awesome Orange scents, will do exactly the same from the outside. Pure Green Coffee Skincare range are made with the highest quality formulas, 100% vegan, cruelty free. Without SLES, parabens and mineral oils. Free from PEGs, TEA, DEA. Wheat and gluten free. Green coffee helps your skin retain moisture – Pure Green Coffee Body Wash, Body Scrub and Face & Body Mask leave your skin feeling soft, smooth and smelling fantastic. Coffee from Pure Green Coffee Company – I can 100% recommend it to you! Maybe it does not taste like a regular coffee from espresso or steamed machine, but it has a lot of health benefits. Because it is a blend of black & green coffee and many herbal supplements. Thanks to this, it has a cleansing effect on the body and improves the metabolism. And although it does not taste like a typical coffee, it does not mean that it tastes bad – it’s actually delicious! ? The green coffee from Pure Green Coffee brand has positively surprised me! I’ve already tried several herbal green coffees … but it always ended up with one sip only. Detox Green Coffee, however, is completely different! It has a delicious aroma and it works perfectly for me – the biggest coffee lover! I am strongly recommending PGCC and their products! The new cappuccino flavor is just insane! @cupofgreencoffee I love this drink for multiple reasons, but first of all it tastes all vanilla-ish! ?❤️ It’s got a mix of coffee, green coffee and superfood herbs that are so good for you! Studies have shown that green coffee helps to reduce bloating, improve metabolism and increase fat burn! And all it takes is a cup a day! Taking this everyday is helping me along with my cut to speed up my fat loss so much ya’llz. I love starting my day with a @cupofgreencoffee ?☕️? Gives me great energy before my workout and keeps my tummy flat!?? I’m at the end of the 28’th day… And i really can tell you that i feel good! Its a work Product, easy to prepare, that dont even need sugar because it tastes really good! Flat tummy even after the holiday thanks to my @cupofgreencoffee detox!? ?☕️?